Santa Mariña, 1 - 15125 Muxía, A Coruña. Before starting your journey, study your route. We will offer you some directions that may be of use. 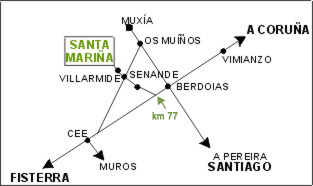 You must bear in mind that our house is located in a small village called Santa Mariña (de Coucieiro) 8 km away from the municipal capital of Muxía. Go to Os Muiños and from there to the right, take the road towards Cee. After about 4 km, in Vilarmide, take the detour to the right next to Onda supermarket. It's signposted. From there it is only 1 km to our house. There is another signposted access through Cruce de Cartel, Cartel and Bouzas villages. You arrive at Cee via the AC-552 and go a further 3 km. You will see a detour to the left (after passing a Ford car showroom on your left) indicating “Muxía”. This road will take you to Os Muiños. You will pass Bermún, Pereiriña, Sinagoga, Mintirans, Caberta, Montesiños, Sorna and then reach Vilarmide. Thre is approximately 7 km. In Vilarmide take a detour to the left, next to Onda supermarket, from here there it is only 1 km to our house. Leave in direction towards Carballo where you can get to by road or motorway. From Carballo continue via the AC-552 until km 77, where you take a detour to the right that shows our house and Senande and Muxía. At about 8 km you will see a crossing in the village of Vilarmide. Here following the indications ahead, turn right and go for about 200m and take the detour on your left next to Onda supermarket. From there it is only 1 km to our house. Leave the city via the road to Noia. When you arrive at Bertamiráns, turn right. Continue this road until Negreira and from there to Pereira, Baiñas and Berdoias. In Berdoias there is a crossing and STOP with the AC-552. Turn left here, towards Fisterra, and in km 77 take the detour to the right. At about 8 km there is a crossing, in the village of Vilarmide. Here following the indications ahead, turn right and go for about 200m and take the detour on your left next to Onda supermarket. From there it is only 1 km to our house. Take the motorway towards Santiago and exit via Padrón. At Picaraña take the detour on your right, next to an industrial park. Go through Os Ánxeles, pass the roundabout and take the road that goes from Santiago to Noia, carry on via Brión and you will reach a crossing . At the crossing take a left towards Negreira. Continue towards Pereira, Baiñas and Berdoias. In Berdoias there is a crossing and STOP with the AC-552. Turn left here, towards Fisterra, and in km 77 take the detour to the right. At about 8 km there is a crossing, in the village of Vilarmide. Here following the indications ahead, turn right and go for about 200m and take the detour on your left next to Onda supermarket. From there it is only 1 km to our house. Take the motorway to Galicia. Don't enter A Coruña. Take the detours that lead to Arteixo and then Carballo. Once in Carballo turn towards Fisterra taking care when exiting. From Carballo continue on the AC-552 until km 77, where you take a detour to the right that shows our house and Senande and Muxía. At about 8 km you will see a crossing in the village of Vilarmide. Here following the indications ahead, turn right and go for about 200m and take the detour on your left next to Onda supermarket. From there it is only 1 km to our house.